International Journal of Research in Health Sciences,2014,2,4,981-986. 1-Associate Professor, 2-Senior Resident, 3-MSc Student, MMIMSR Mullana, Ambala, INDIA. Background: Anaemia during pregnancy can lead to morbidity and mortality in mother as well as fetus. Anaemia cannot be diagnosed based upon the clinical picture alone and blood test is a definitive evidence of the same. The hematologic status in pregnant women can be evaluated by measuring different blood indices. Aim: The aim of our present study was to determine the effect of pregnancy on haematological parameters and to compare the haematological parameters at different stages of pregnancy. Settings: Tertiary care hospital. Study design: Prospective study. Methodology: A prospective study was carried out in the Department of Pathology at MMIMSR, Mullana, Ambala, from May 2011 to September 2013. The antenatal cases reporting to the Department of Obstetrics and Gynaecology of M.M.I.M.S.R. Mullana were included in the study. The blood samples from all cases were analysed for various hematological parameters on automated cell counter. Results: The mean RBC (103/μl) were 3.23, 3.46, 3.29 and 3.25 in the age group <19, 20-25, 26-30 and 31-35 respectively. Mean MCV (fl) were 83.06, 76.45, 80.65, and 85.36, MCH (pg) were 26.9, 27.42, 27.67, 28.05 and MCHC (gm/dl) were 30.06, 30.89, 30.99 and 32.38 in the above age groups. Mean PCV (%) were 30.2, 28.73, 30.33 and 33.93 in the age group < 19, 20-25, 26-30 and 31-35 respectively. TLC was significantly higher in 68 (77.5%) cases and remained elevated throughout pregnancy. 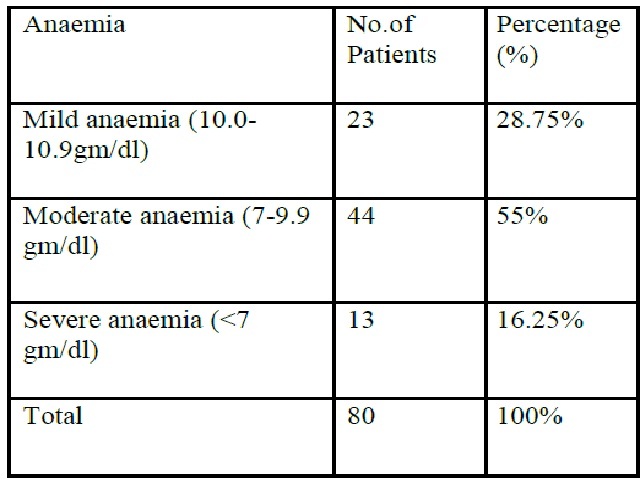 Conclusion: Anaemia can be easily diagnosed and responds quickly to intervention and treatment that is both inexpensive and readily available.